Announcing The Undercurrent’s Summer Distribution Story Contest Winners! Congratulations to our Summer 2011 Distribution Story Contest winners! Each winner will receive an Amazon.com gift card. You can view the top two entries below. Thank you to everyone who participated! If you’d like to send us your anecdotes and pictures about distributing TU, please e-mail us at contact@the-undercurrent.com. Receiving stories from those who work hard to distribute the paper is rewarding for everyone involved with The Undercurrent, from the writers to the donors and staff members. It also gives us a better perspective on our distribution process and lets us know how we’re reaching young minds. First Place – Sarah J. 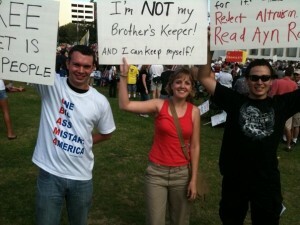 A couple months after the Tea Party movement really got off the ground, when bailouts and TARP and “Cash for Clunkers” programs were still in the news, I attended the West Coast Tax Day Protest in Los Angeles. There was a great turn out for the event and people were mad as hell at the direction the Obama administration was taking “Hope and Change.” People wanted to get involved, and they wanted to talk about ideas. I walked through the crowd during the speeches, going person-to-person handing out the Tea Party special issue of TU. I got my spiel down to about two seconds: I would hand a person a copy and say “this is a campus paper about free minds and free markets.” People responded very positively to that description, and only a couple asked for more information before they took a copy. When I accidentally offered the paper to one man who had already gotten one, he told me, “I already started reading it; it’s great!” While I was handing out the last of my copies, I had some people sprint over to me from the other side of the crowd to make sure they got a copy. They were afraid I was going to run out of copies—for good reason, because my two friends and I eventually handed out the entire box of several hundred copies of TU that we had brought to the protest. I wished we had brought more copies! After handing out all our copies of The Undercurrent, we waved our home-made picket signs at passing cars. We got a lot of honks! Second Place – Julian H.
Since I am a Vassar College EMT, I know my way around campus very well. Last fall, I met with a student founding a libertarian group because I was planning the Vassar Values Reason project to spread reason and Ayn Rand’s ideas on campus. From him I picked up a box of The Undercurrent that we agreed I should be the one to distribute. That same night I went into all of the dorms as well as the student center to deposit copies of The Undercurrent in easily visible and accessible locations. It was getting late, but there was one last place I wanted to leave a copy before I called it a night. In the dark I passed by a security guard who asked me what I had in the box. When I told him I was delivering The Undercurrent, he looked at me subversively—I asked him, in turn, if he wanted a copy. At my destination in an academic building, I placed a copy in a professor’s mailbox with a post-it note thanking him for meeting with me about my Reason project. While said professor is not an Objectivist, he is a big supporter of Ayn Rand’s epistemology. Knowing this, I could not have known that he would assign Daniel Casper’s article “Embracing the ‘Unnatural’” as required reading for discussion in a freshman writing science seminar that week. Thrilled, I shared the news with Matthew Morgen, Campus Clubs Coordinator at the Ayn Rand Institute, who agreed that it was remarkable, as well as TU author Daniel Casper, who I enabled to get in touch with the professor. In the professor’s spring 2010 Convocation Address, he remarked on his own intellectual beginnings as a Vassar alumnus. 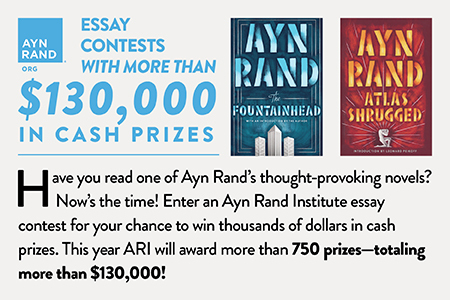 The continued circulation of TU on campus will guarantee that Ayn Rand’s ideas will never, ever, ever lack for students to engage with at Vassar. For several weeks, Vassar students, faculty, and visitors encountered The Undercurrent, both in the classroom and in campus life. 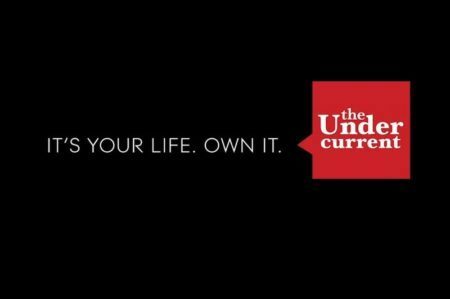 Announcing The Undercurrent’s Distribution Story Contest Winners!